Watch: Natural Peanut Butter VS. Reduced-fat Peanut Butter. Which is healthier? There was a year of my life, first grade, when I literally ate peanut butter and jelly sandwiches every single day without fail, even on weekends. It’s not that I was a timid eater—at that age I was happily sampling my mom’s macrobiotic vegan experiments and even requesting some favorites of my own—it’s just that when you find a good thing you stick with it. And I did, tenaciously. Though other meals made it into the lunch rotation after a year or two, peanut butter and jelly was a mainstay throughout my childhood, along with its attendant variations: peanut butter and banana, peanut butter and Fluff, peanut butter straight-from-the-spoon-hold-the-bread. It wasn’t a bad thing, nutrition-wise. While peanut butter is high in fat and is a concentrated source of calories, it’s not fattening—you just don’t want to go overboard. Luckily, you don’t need much to feel satisfied: just a tablespoon (90 calories) or two of peanut butter goes a long way. 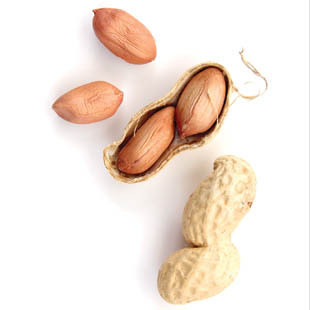 Plus, peanut butter provides protein and folate, a B vitamin important for the healthy development of new cells. But there came a point in adulthood when I started paying attention to things like grams of sodium per serving and just what “hydrogenated soybean oil” is. I’d read the long, trailing list of ingredients on favorite products and wonder, “What the heck is this stuff?” What exactly makes my favorite creamy peanut butter so creamy? Do I even want to know? That’s why I’m such a fan of natural peanut butters. Take all the extra junk out of a normal jar and what you’ve got left is just plain old mashed-up peanuts with a pinch of salt. Delicious. Some might be turned off by the way oil separates out, but I’ve found that if you simply leave the peanut butter upside down for about an hour, the oil will migrate up to the jar bottom so it’s easier to stir without making a mess. After stirring, you can store it in the refrigerator. Of course, not all natural peanut butters, or jellies for that matter, are created equal. EatingWell taste-tested different brands of smooth natural peanut butters to find some of the best of the bunch that are nationally available. We put a range of low-sugar strawberry jams and jellies to the test too. (Why strawberry? I think I speak objectively for PB&J fans everywhere when I say that strawberry is obviously the best.) Our guidelines: Anything containing high-fructose corn syrup was eliminated right off the bat. The ingredients had to list strawberries first or second, juice concentrates were the preferred sweetener and a tablespoon of jam had to contain 40 or less calories. So, savor our results! Next time you get a hankering for creamy, toasted peanuts and sweet, sticky jam, you can feel confident knowing you’re reaching for reader-approved favorites. The omnipresent Smucker’s brand garnered high marks in all categories. Tasters called its grainier texture “the crunchy-lover’s smooth” and said it had “more peanut butter taste.” It was one taster’s top pick for natural peanut butter. Tasters loved this peanut butter’s “very peanuty” taste and “good consistency.” While some found it “too salty,” and one taster commented that “it was so sticky it was hard to swallow,” the general consensus was that this was a well-flavored and textured option.